Last weekend eight Earth First!ers traveled across the Everglades to attend the eighth annual All Power to the Imagination! conference, where we met some anarchists who seemed to share our enthusiasm for exclamation-marked titles. API! 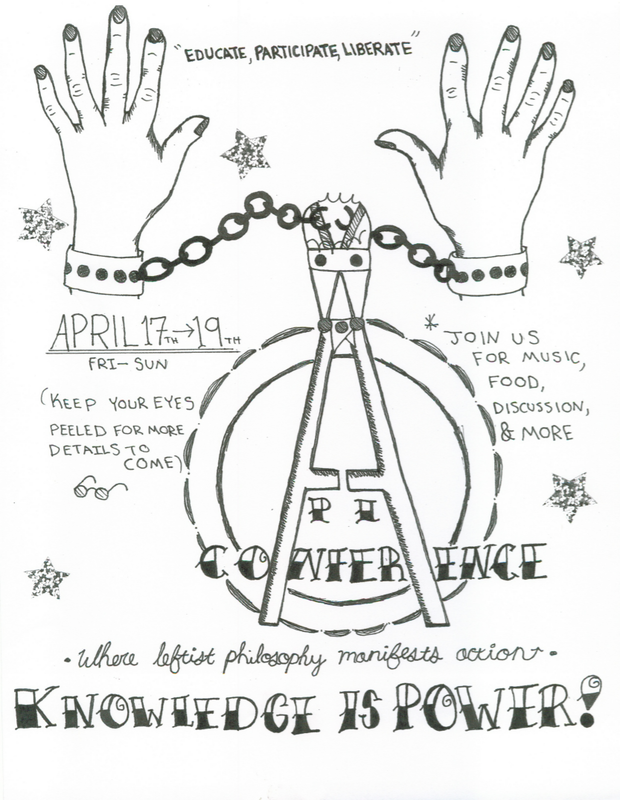 is a conference that New College of Florida students put on every year to “bridge the gap between radical theory and practice.” In other words, after all that book-learnin’, they’re hungry for something real. The workshops ranged from a talk on the Rojava revolution to an interrogation of white supremacy through dance—and of course the tree climbing and direct action training by EEF!. After two days of workshops there was a community-led march for justice in Newtown, a predominantly black area of Sarasota that has seen only disinvestment and apathy from the local government since its beginning. As a New-College-student-turned-EEF!er, I was happy to go back to my old home and share direct action skills with some new faces. And believe me, Sarasota could use some direct action. Don’t be fooled by the nice face the city puts on for the public—from laws that criminalize houseless people to enormous food deserts and police murders, Sarasota is a hotbed of injustice in Florida and in need of some serious TLC (and by TLC, I mean direct action). API! is taking the first steps in speaking out about these issues, and we hope there is more to come. And if, in some not-too-distant future, someone happens to lock their neck to the door of a City Council meeting while they discuss the next criminalizing measure against houseless people in the city, I’ll be on the next Greyhound bus over there to help with direct support. 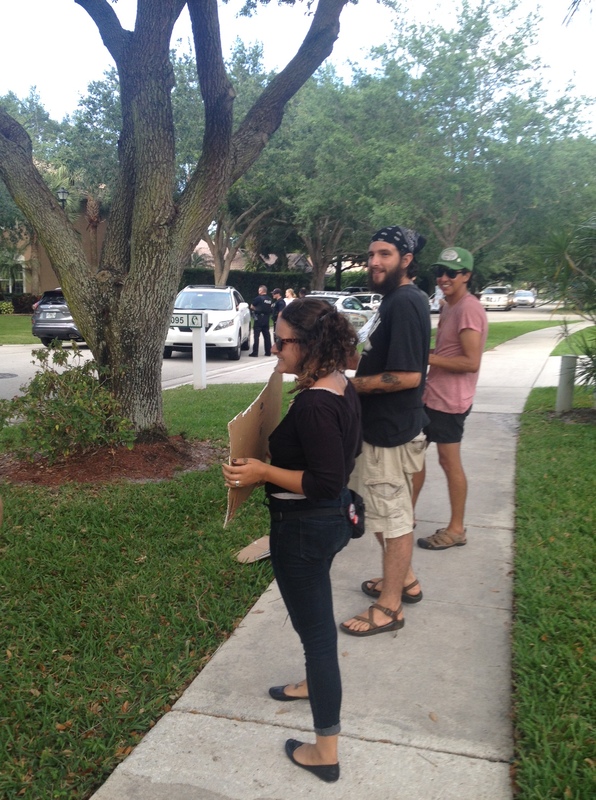 Members of Everglades Earth First! held two protests on Monday calling for the preservation of the Briger Forest and an end to the Alton Homes project that threatens it. 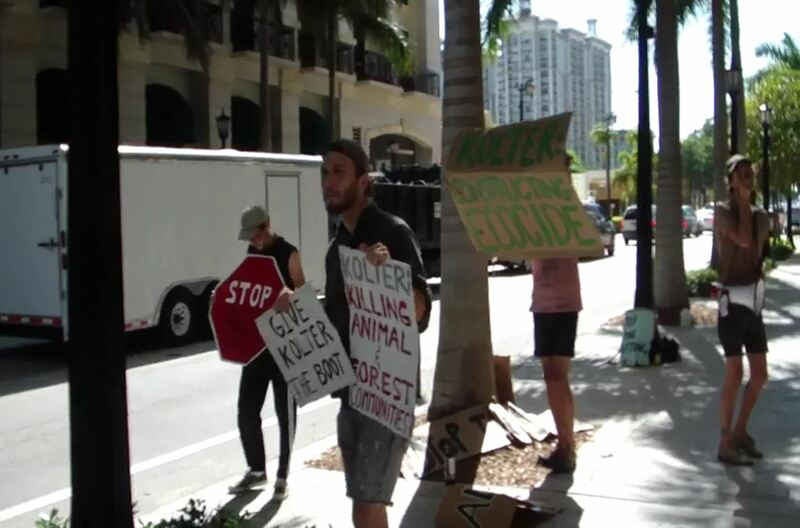 For an hour protesters rallied outside the offices of Kolter Group, the company responsible for destroying hundreds of acres of threatened and endangered species’ habitat to make way for upscale housing and a planned biotech city. Activists screamed chants and yelled through windows and air vents to let Kolter’s employees know that the pressure will not cease until they stop destroying the forest. When typical work hours ended, the protesters then paid a visit to the home of Ed Jahn, Senior Vice President of Kolter Urban, LLC. Using loud chants and signs, protesters made it clear to Ed and his neighbors that desecrating bio-diverse wilderness and trashing land that people love is a personal issue. 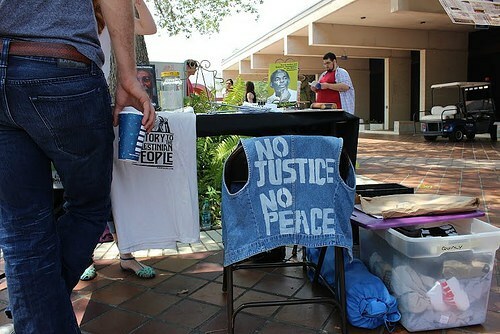 During both protests, neighbors and police gathered around the demonstrations. Some neighbors were quite supportive, and were shocked to find out that the company or person they live next to is profiting off of the death of endangered species. Others were not so supportive, and clearly more concerned with maintaining the peace and quiet of their neighborhoods. To them the message was relayed that the only power they have to end these protests is to convince Kolter Group and Ed Jahn to stop destroying the planet, or to move. This is personal, and Everglades Earth First! will not back down until Kolter stops the killing. 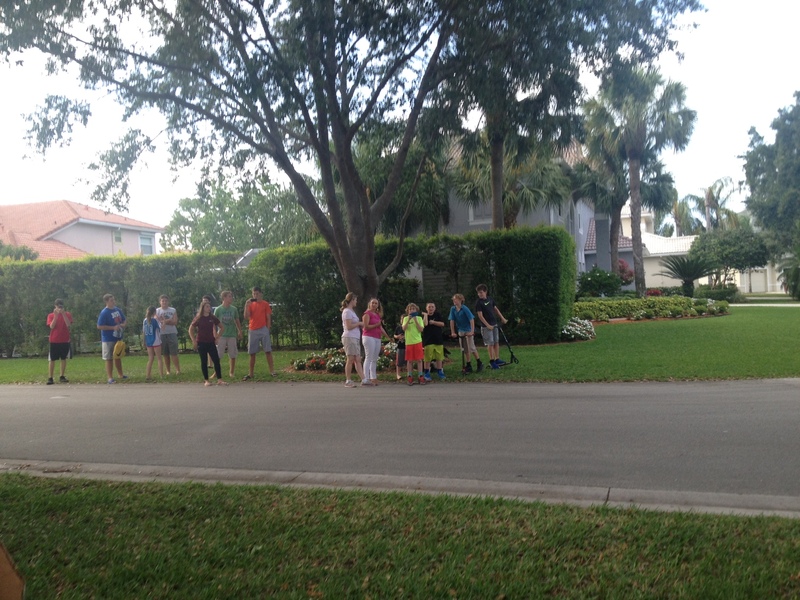 As protesters departed, local children asked us if we were coming back tomorrow. “Of course!” yelled the protesters. 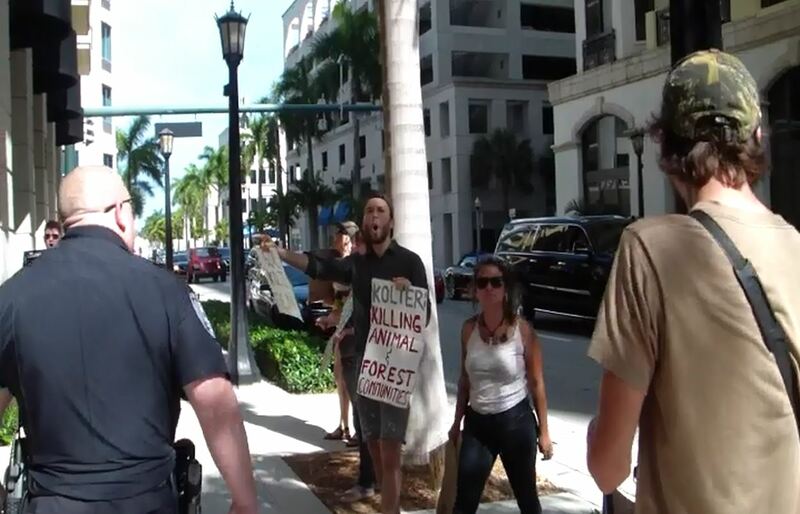 On Friday, April 10, protesters gathered outside of Kolter Group’s West Palm Beach headquarters to call for the protection of the Briger Forest. 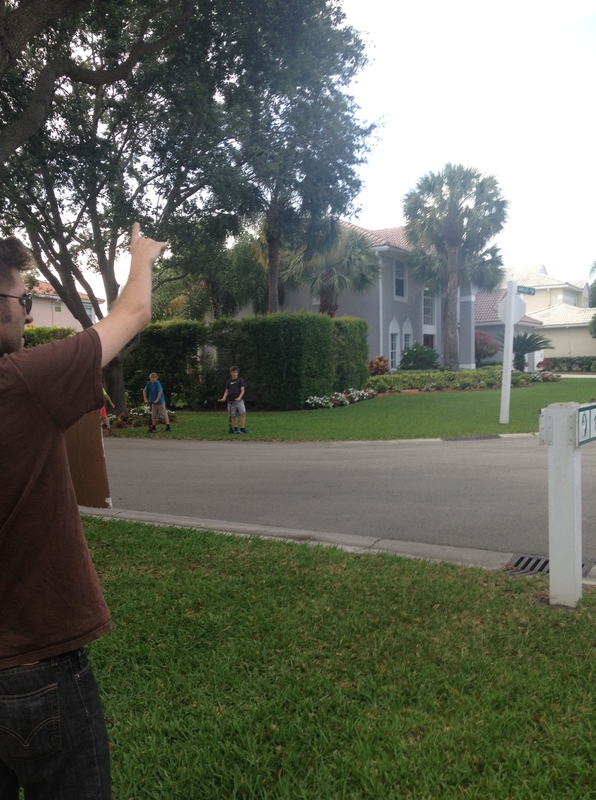 The group waved signs, shouted chants, and informed residents about Kolter’s destruction of local wilderness. Despite public outcry, Kolter Group continues with its plan to level hundreds of acres of South Florida’s Briger Forest, one of the few biodiverse tracts of land in the area, and home to threatened and endangered species. The fiery protests and public opposition will not stop until Kolter Group cancels their contracts and pulls their bulldozers and excavators out of the forest! 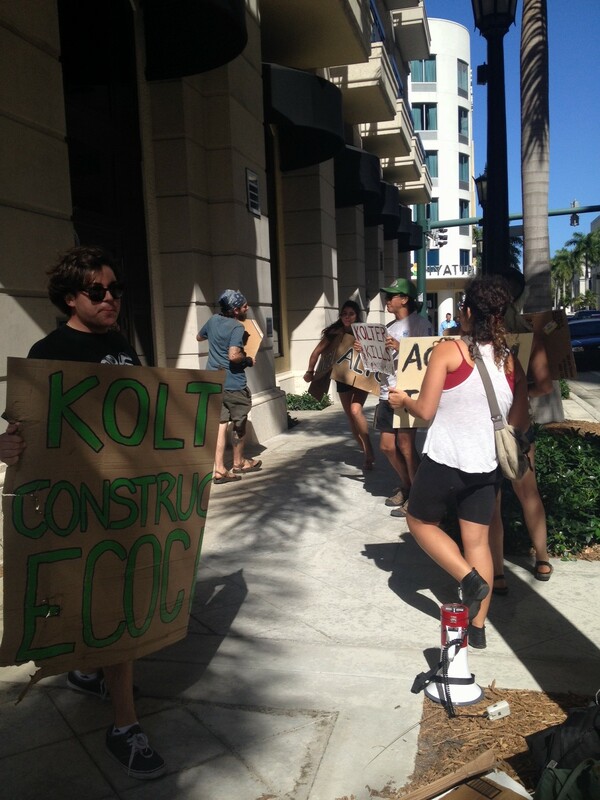 On Wednesday, April 8, local activists gathered outside of Kolter Group’s West Palm Beach offices, using megaphones and signs to spread the message that the Briger Forest won’t be bulldozed without a fight. Kolter Group is already responsible for hundreds of acres of the Briger Forest being decimated. The destruction is being done to make way for Alton Homes, an upscale neighborhood and the first step in a planned biotech city complete with artificial ponds and animal testing laboratories. Protests have been occurring outside of Kolter’s offices since January 26, when two activists locked down inside Kolter’s headquarters. After years of petitions, letters, phone calls, and groveling at city commission meetings, local environmentalists were willing to do anything they could to get their voices heard. Their voices are clearly being noticed now. 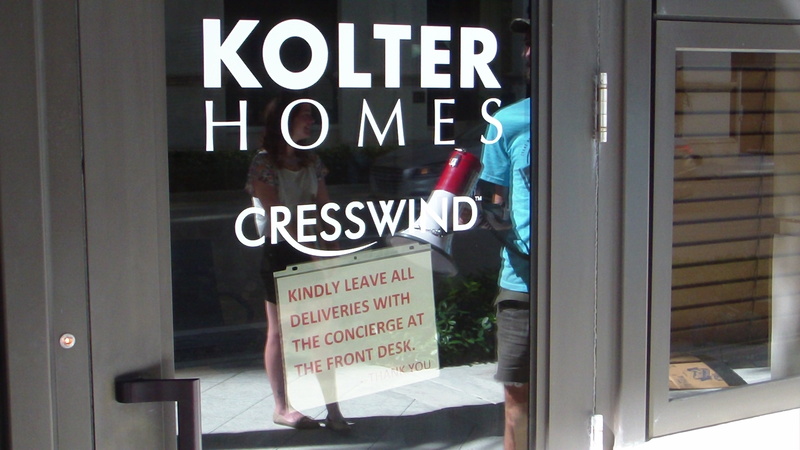 Kolter has been hiding from protesters, locking the doors, shutting the blinds, even refusing to let deliveries in while protests are active. If you live in the area, and are opposed to the destruction of wild forest for the gain of a few already rich individuals, please contact Kolter and tell them so. Tell them that you oppose the project, and that you support the protests—protests which will continue, and escalate, until Kolter stops the destruction of the Briger.